Former CIC Shri Gandhi has underlined the need for video-recording of Court proceedings to foster greater transparency in judiciary and to keep the ordinary people informed of the true state of affairs of the Indian judiciary. 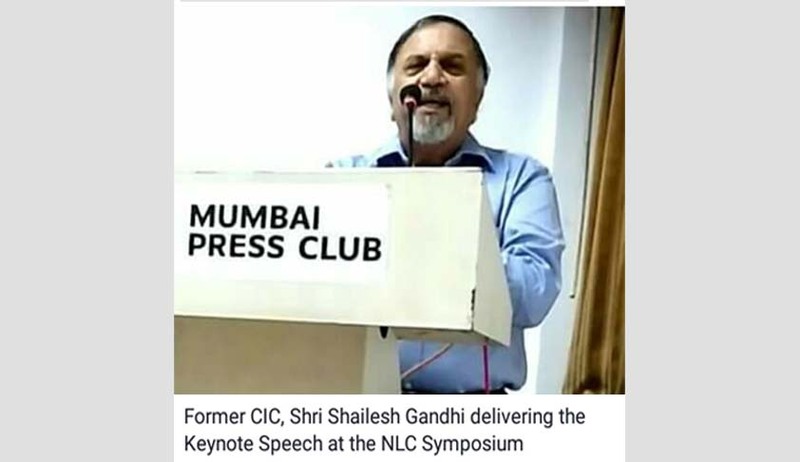 He was delivering the key note address in a symposium organised by the National Lawyers Campaign for Judicial Transparency and Reforms, on video-recording of the proceedings of the Supreme Court and High Courts, nay, all Courts and Tribunals at the Press Club, Mumbai. While emphasizing the need for video-recording of Court proceedings, Shri Gandhi also lamented about the fate of under trials languishing in prisons, the inordinate delay in the appointment of Judges, the need of the institution of judiciary accountable to the people and responsive enough to the requirement of the people, like any other department of the Government. Shri Mathews J. Nedumpara, President of NLC, presided over the function. He underlined the need to bring in greater transparency in the appointment of Judges of the Supreme Court and High Courts. He criticized the NJAC judgment, saying that it has literally meant the reviving of the collegium system of Judges appointing. He also lamented that the collegium system has jeopardized the independence of the High Courts because the Judges of the High Courts while delivering judgments are all likely to be over concerned about their judgments displeasing the senior Judges of the Supreme Court who constitute to be the members of the collegium. Transparency activists from different parts of the country, Shri R.P. Luthra, Shri R.K. Dey, Col. Ved Prakash, and Shri Bijoy Krishna Adhikari, emphasized the need to dispense with the concept of contempt by scandalizing the Court, which has meant the very fundamental right of freedom of speech being rendered nugatory. The speakers also deliberated on the total non-existence of a mechanism to address the grievances and complaints against Judges of the higher judiciary. The noted activists, Mrs. Ruta Samant, Shri Sunil Gupta, the Petitioner in a Writ Petition in the Bombay High Court seeking video-recording of Court proceedings Shri Sohal Singh et al, also spoke on the denial of justice to the poor sections of the society. Shri Rajeshwar Panchal, a lawyer from Bombay Bar, was most vocal in his criticism of the criminal justice administration, a scenario where police resort to arrest without any justification, the mechanical manner in which applications for bail by poor people are dealt with and almost in all cases mechanically rejecting them. He cited a number of cases where the accused who are poor had to remain incarcerated pending trial and sometimes even after appeal and in the end being acquitted, which means nothing but an innocent person being incarcerated for many years, losing his family, health, and the system in no way coming forward to compensate him.